HAHA! Love it! I had one like this. But I ended up without a midwife because I denied it for too long! My first birth was a medicated hospital birth that I went into saying "Epidurals were invented for ME!" But it turned out to be such a bad experience, immediately after jC's birth I told my husband we'd be adopting if we wanted more. That experience got me thinking maybe I should try the natural route. So the second time around was a natural hospital birth. On the drive home from the hospital I told my husband "If I can do it without an epidural, I might as well just have the next one at home and not have to deal with any of that hospital stuff." Little did he know, I was serious. Who would have ever thought that this is where I'd give birth? Not me. I always thought that people who had babies at home must be crazy. (Which would mean my mom is crazy since she had ME at home!) So, either people that have home births ARE crazy or I was wrong. It was Monday, November 5 and I expected NOTHING that day. My estimated due date was November 7, and since jC was born on his due date, and luC 5 days "over due", I only assumed that cC would at least meet his date, as well, if not exceed it. jC usually has preschool Mondays but it was a teacher work day. So after I took him and luC with me to my weekly chiropractic appointment at 9:30 am, we headed to to my favorite children's consignment store about 25 minutes away. They have a play area for the kids so I very slowly shopped for what I was looking for, letting them play...until they started leaving the play area and playing with merchandise. As we drove back home I was having contractions that I assumed were Braxton Hicks. Since we'd been out and I hadn't been drinking water and I always get BH contractions when I'm not drinking enough water. A little after 2 I thought that the contractions seemed a little stronger than Braxton Hicks but other than that I didn't feel any different. I have this thing where I expect every labor to be the same. jC's labor started with bloody show and cramps. luC's labor started with my water breaking. I assumed that this labor would have to start one of those two ways. And since neither of those things had happened, I obviously wasn't in labor. For fun, I decided to start timing the contractions at about 3 pm, and they were ranging from 2 to 4 mins apart. I got the kids up, and then texted my husband at about 3:15 and jokingly said I didn't think he'd make it to work the next day. He knew I was joking and replied with "WHAAAAT?!" Then told him I was having contractions but didn't really think it was anything. Then I texted my midwife to tell her that MAYBE I'm in labor but I don't think I am because it was only mild BH type contractions. I told her I didn't think its anything but wanted to let her know just in case. About 3:30 my husband asked if he should come home. I said probably sooner than later just in case, but mostly I just wanted him to come home for fun. Then because the kids were driving me nuts, I said that yes he should come. When he got home I was skyping with my mom, who had called at 3:55. I told her that I wasn't sure but I think something might be going on. I got a load of laundry and took it upstairs to fold and put away and then laid on the bed to rest for a bit since my husband was home to take care of the kids. Around 5 pm I told him to go ahead and make dinner. We had chicken tikka masala from Costco in the fridge and I rested while he got it ready. When I went down for dinner around 6, the contractions were definitely stronger, but I was still thinking there should be more side effects or something. Still no bloody show. Still no cramps. No water breaking. How could I be in labor if those things weren't happening? We ate dinner, I cleaned up a bit in our bathroom, then I put jC to bed while my husband put luC to bed. jC likes me to read him a book, so as I got in the bed I had a contraction. I lied there with him and read the book, and I'd never read it so fast. I didn't have a single contraction as I read him the book, which made me think again that I wasn't in labor. Then as I got out of the bed, I had another contraction. As I stopped on my hands and knees to get through the contraction on his bed, jC asked me what was going on. I told him that maybe the baby was coming, and I hoped I was right so he wouldn't be disappointed in the morning. Every now and again my midwife would text me asking how things are going. I kept telling her that I was still having contractions and they were getting intense but nothing else was going on. She kept saying she was going to come and be close by, or go to dinner, etc, and she could check me, but I'd say that I was fine and we were busy, so do whatever she needed to do. At about 7 my husband and I got the bedroom prepped for everything, you know...just to be prepared in case anything happened. 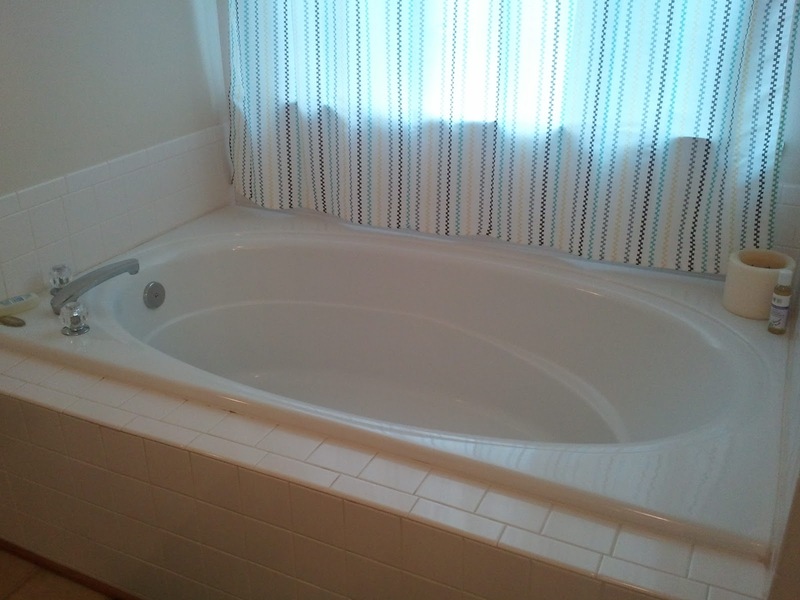 Then I got in the bath tub to try to relax. The contractions were getting stronger. It all felt surreal, and I was mostly just going through the motions of getting things ready even though I wasn't convinced it was happening. My midwife and assistant got to my house around 7:45 pm. Soon after I got out of the tub...cant remember why. I still was saying I wasn't sure what was going on and if it was really happening. But my contractions were definitely getting stronger and I was having to work harder to breath through them. It was probably around 8:20 that there was a little bit of blood and I was finally like "OK, this is really labor". I was finally convinced and was mentally preparing myself for things to start happening soon. I got back in the tub and after a couple intense contractions it got really intense! 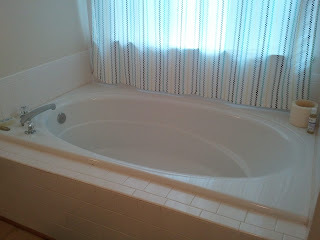 My husband was sitting at the edge of the tub timing them, and the midwife and her assistant were downstairs. They heard me when the contractions got much more intense and came to see how things were progressing. I had done pretty good with not "vocalizing" (screaming), like I did with luC, but when it got to that point, I definitely started getting louder. I had a super intense contraction where I could feel pushing...not me pushing but my body pushing. During this time I was on my knees, with my arms resting on the side of the tub, and putting my head down on my arms when I had the contractions. My midwife and her assistant that were downstairs heard me and came up to check things out. I remember my husband jokingly making a comment to my midwife about how I needed to hurry because "Hoarders" was starting in 5 minutes. I remember thinking "Oh great, this is the memory that is going to stick in my head about my labor" and it has! My midwife said I was fine how I was, but because of the position I was in, I'd have to catch the baby myself because they wouldn't be able to reach him.. For some reason the added responsibility of catching the baby seemed too much, so I turned so my back was to them so they could catch the baby. After I moved the contractions came one after the other and my body took over with pushing and it was soooo intense and so surreal. I wasn't doing anything, my body was. It's amazing to think about how my brain was trying to catch on to what my body was doing. Like when I heard and felt a pop soon after there was pushing, and I was wondering what it was. Then I realized that my water broke. It was the most intense pain ever, and I remember saying "I can't do this!" because, you know...I had a choice at this point. What I'm assuming was about a minute later, cC was born at 9:08 pm. When he came out apparently his body came up front towards me instead of back towards them (which is what normally happens) so I scooped him up, which I never thought I'd do. It's kind of amazing to actually get to be the first one to hold him, since my previous two were first held by the midwife at the hospital that delivered them. Having a baby, in my house, in my own way was absolutely amazing. My husband joked that he wanted his money back because the midwives didn't even do anything, I did it all myself. (They obviously DID do stuff, like take care of me and the baby after his birth. And getting me to calm down a bit when I needed a reminder to do so during labor) There was no checking to see how far dilated I was (Thank goodness, that's one of the worst parts of labor). There was no one telling me it was time to push. No sitting in a hospital bed in one of the worst positions to birth. No one telling me when to push and counting me through it. It was all me, all my body. Even though I had luC naturally, this experience was completely different. I was so aware of every part of my body. So aware of how amazing it was that my body was doing the work and knew what to do. So aware of every single aspect of the miracle that childbirth is. Seriously, how amazing is it that these little humans grow inside you, and one second they are there, a part of you, and the next they are out in this world. It all happened the way I said I wanted it to. I always told my midwife that my dream would be that I'd go into labor one afternoon, be fine, get the kids in bed, and have them asleep in their rooms when I gave birth. I didn't really expect it to happen that way, but I'm glad it did. ANd I have to say, I'm glad I was in denial about it all day so that I could go about my day not completely focusing on it. It was truly an amazing experience.